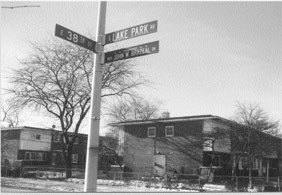 The Madden Park Homes were the last public housing project to be completed in Chicago as they were complete in the year 1970. 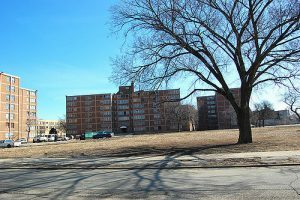 Although public housing projects were forbidden from being built starting in 1969 the Madden Park project was already in planning since 1961; however, the projects were not completed until 1970 for some reason. This new project consisted of three 9 story mid rises and seven 3 story low rises, all together consisting of 450 units. These projects were opened right at a time when the Oakland neighborhood was experiencing more crime and gang activity and by the late 1970s the crime and gangs entered the Madden Park Homes, the Black Gangster Disciples being the strongest influence on these projects. In the 1980s and 1990s the Madden Park projects became heavily infested with transient gang activity and transient drug addicts inhabited these buildings. Massive gang wars erupted between Gangster Disciples and Black P Stones in and around these projects as the Gangster Disciples bid for complete control of the drug trade. Security guards were even targeted in this complex which even resulted in a guard getting mowed down by automatic gun fire in a security booth in 1988. In 1994 a major group of Gangsters Disciples switched gangs to becoming Black Disciples gang members which caused the gang wars to increase in intensity as GDs and BDs fought viciously all around the complex that resulted in piles of bullet shell casings piling up on the sidewalks. In the year 1999 the project buildings began demolition until 2005 when the last buildings were torn down.